Ms. Goodnight Little Spoon writes such incredible letters. I am spoiled. 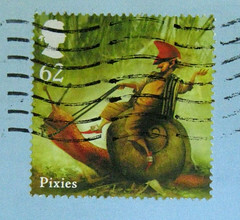 (Alas, less spoiled than I could be because I fear her latest mail-art marvel sent to me has never arrived, the second piece of blogged-about mail in the past month that I have seen online but not received, argh.) But to focus on the positive of this loveliness - WOW! 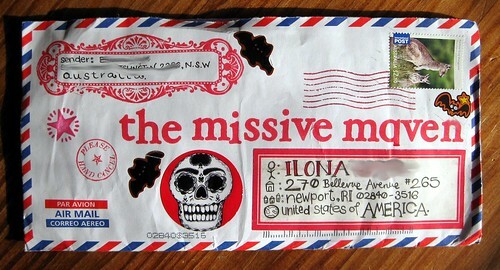 What a decorated envelope! I love how the q substitutes for an a. All kinds of goodness on the back, but of course my very favorite is the gonzo sticker. These items came from her trip to Tasmania. 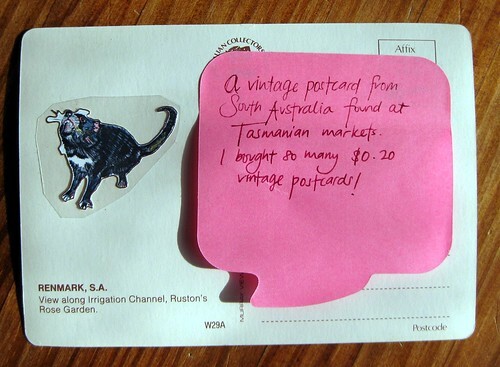 The vintage postcard is truly lovely, but I confess I've never in my life seen a cooler sticker than this little Tasmanian Devil! Clearly her submissions have won both the coolest postcard AND the coolest sticker awards, all for the little Tasmanian Devil grooviness. I can't even decide how I will ever use this fantastic sticker, so right now he just lives in the side of my clear stamp drawer storage unit, so I can see him looking out at me from the clear plastic. I often look at him when I'm writing letters and he makes me smirk. Very lovely bit of mail! Gosh, Bianca freaking rocks. And 20 cent postcards?! Lucky! Even my antique/vintage shops charge a buck each! :( Then again, it's California, lol. Oh yes clearly Mail Joy !!! I love it. always enjoy reading your post and looking at pics of mail art you receive. i am sending you something today. 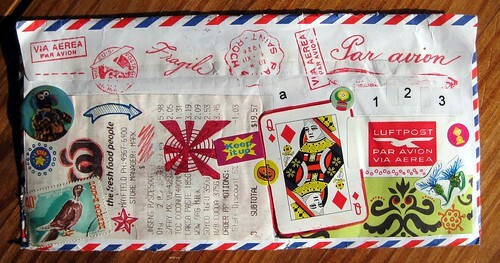 if you view my blog http://thelittleredrobinhappymailbox.blogspot.com/ you can see what i am sending you. best wishes. Airia - thanks! I will hold off looking at your blog in order to keep it a secret... if I can resist! Well, I have something to confess... the envacordion is still sitting on my desk, and hasn't (thank goodness) been lost in the post. I think I'll have to finish it today on my day off and get it in the mail for you. How's your mail pile? Mine is still at thirty. It would be really good if I could just match my incoming with my outgoing, then I'd keep up better! Bee sends some of the greatest mail-art and letters I've ever seen and received. Some people can write really great letters but the exterior is extremely boring and visa-versa. Bee (and you, no joke) are two of the very few exceptions to the former stated. Stinks you haven't received her 'envaccordion' yet. :[ Australia Post seems to be the most finicky postal system out there. A pen pal from AU has sent me six missives the past couple months and I've yet to receive them. :/ Hope you receive yours soon Miss I! 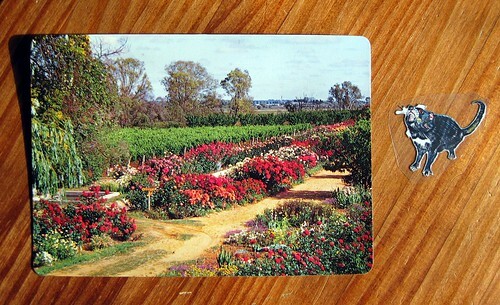 Oh and I LOVE that cute little Tasmania postcard. So pretty; and I can't believe she found vintage postcards for 20 cents! And um, since I have to flip to the last page of a book to see how it ends as I begin reading, I had to go check out Airia's incoming mail. It's great! Lauren, your compliments are so sweet, thank you very much. Bianca's letters are really wonderful! !